If you order blueberry pancakes at a restaurant or even make them at you home, you will likely find yourself with a high carb and high sugar meal that will undermine weight loss. You don’t need to worry about the carbs, calories or sugar with Bari Life Blueberry Protein Pancake Mix! With only 7 grams of carbs and 1 gram of sugar you can have your pancakes and lose weight, too! What a berry nice way to start your day and lose weight! 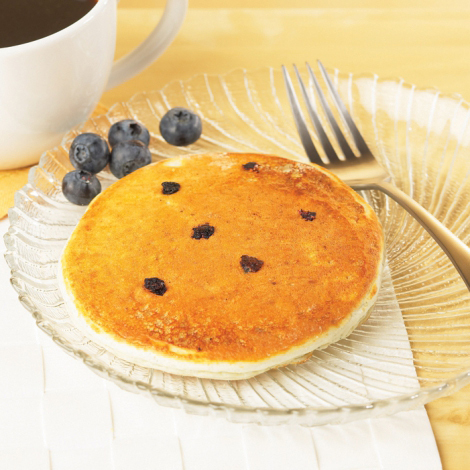 Real blueberries guarantee that you can’t go wrong with this high protein and low calorie bariatric hotcake mix. Have them on their own as an instant delicious breakfast, or serve them with eggs. They are super easy to whip up since all you have to do is add water to the mix and heat up your skillet! Each packet of blueberry pancakes has 90 calories, 7 grams of carbs and 15 grams of protein. What a way to start the day! For guidance on how to use this item as part of a healthy weight loss plan click here view our Bariatric Diet Plan. Whey Protein Concentrate, Milk Protein Isolate, Whole Wheat Flour, Natural and Artificial Flavors, Blueberries, Potato Starch, Guar Gum, Egg Substitute (Food Starch-Modified, Hydroxypropyl Methylcellulose, Xanthan Gum), Baking Soda (Sodium Bicarbonate), Baking Powder (Sodium Acid Pyrophosphate, Sodium Bicarbonate, Corn Starch, Monocalcium Phosphate), Salt, Sucralose, Fructose, Citric Acid, Soy Lecithin. Contains soy and milk. Manufactured on equipment that processes wheat (gluten), egg, peanuts and tree nuts. This was good~I think my cooking technique was off because it turned into scrambled pancake, but it tasted great! I will keep practicing! I really like this flavor the best out of all the other pancake flavors. The batter is a little runny at first, but when it is finished it tastes great. I was a little worried about this as I was making it but the pancake turned out beautiful and it tasted great too! Pour mixture into the frying pan and cook 2 minutes on each side.